Being an old-school kind of guy, I love it when modern technology meets history. That’s the reason the upcoming Muzen OTR Wood speaker is so attractive to me. I had the opportunity to test a prototype of this little speaker recently, and I think anyone with a love of history and workmanship will appreciate it. The Muzen OTR Wood will available through a crowdfunding campaign soon... but let's look at the device before I tell you how to get one. The Muzen OTR Wood is a joint venture between a longtime radio enthusiast and Radio Caroline, which I’ll talk about later. The radio enthusiast is Dejun Zeng, who has won five CES Innovation Awards and who designed China’s first commercial tube amplifier. 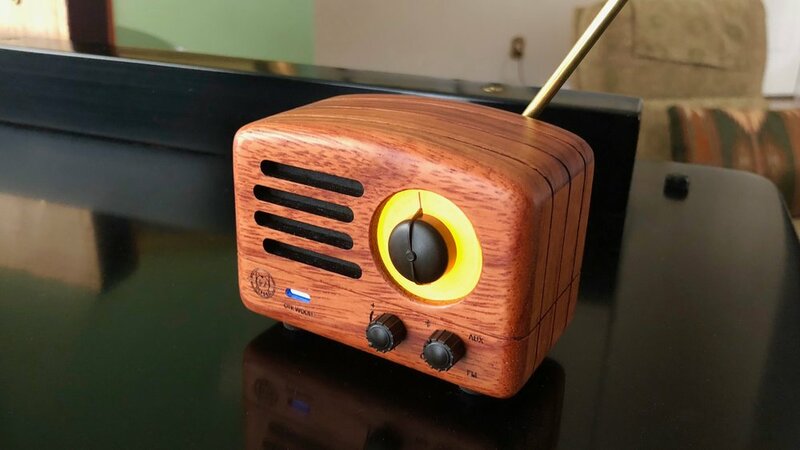 As a radio fan, Mr. Zeng wanted to design a retro-style radio that used today’s technology, and the Muzen OTR Wood is the result. It has a hand-finished wood case and is only 10 x 7 x 5 cm in size (3.94 x 2.76 x 1.97 inches), weighing just 195.6 grams (6.9 ounces). The design achieves the retro feel and the only word I can use to describe it is "delightful!" Turn on the Muzen OTR Wood by turning a little 4-position knob on the front, and an orange light shines behind the circular radio dial. There’s another knob in the center of the dial that lets you call up your favorite FM radio station when the power knob is turned to FM mode. There are also AUX and Bluetooth modes. The retro feel doesn’t end there: the Muzen OTR Wood comes with an antenna that plugs into the back using a modern micro-USB connector, and the prototype I received came with not only a leather carrying case with a shoulder strap, but was boxed in a beautiful leather case as well. There’s a modern touch on the front — an LED that glows green when the radio is tuned to FM, orange when it’s receiving AUX input, or white when connected to Bluetooth. The Muzen OTR Wood is powered by a lithium-ion battery that is charged through the same micro-USB port that’s used by the antenna. It’s designed to run for up to 10 hours on a single charge. Don’t let the small size of this speaker lead you to believe that it doesn’t have great sound. It has a full and “large” sound that will surprise you, along with a very wide response range. Unlike some speakers that tend to emphasize bass to the exclusion of everything else, the Muzen OTR Wood sounds great across the sound spectrum. Now, about pirate radio… Back in 1964, an Irish musician manager named Ronan O’Rahilly got irritated he couldn’t promote one of his musicians on a European station that would only play music from major record labels. The result? He got backing from investors, bought a ship, and began broadcasting from an anchorage off the coast of Suffolk, England. The radio station was named after the late President Kennedy’s daughter Caroline and went on to fame as Radio Caroline. Wikipedia has a full and detailed history of the station, the ships, and many of the personalities that have been involved with Radio Caroline. The idea was to break the monopoly of the BBC and other state-run radio stations, and to date Radio Caroline is still broadcasting. You can listen to it on the Internet, or if you’re in the UK there’s now a land-based AM station (Radio Caroline AM on 648kHz) that went on the air in November of 2017. There’s even an iOS app for listening to Radio Caroline on your iPhone or iPad…and streaming it to your Muzen OTR Wood over Bluetooth. So what does the Muzen OTR Wood have to do with Radio Caroline? 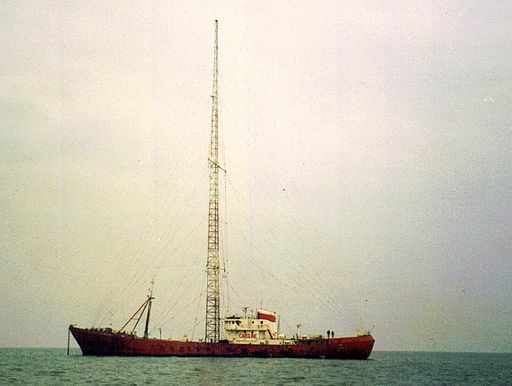 When the crowdfunding campaign for the Muzen OTR Wood goes live, a full 10% of the proceeds will be donated to Radio Caroline to keep it running, as it survives mainly on the support of listeners. We get a lot of Bluetooth speakers to test, and it’s nice to get one that not only looks and sounds great, but has some fascinating history behind it as well. While the crowdfunding campaign hasn’t started yet, you can sign up here to be notified when the Muzen OTR Wood goes live.